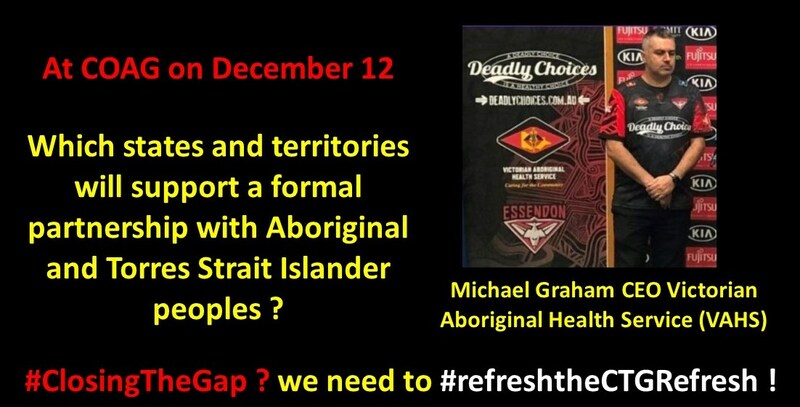 NACCHO Aboriginal Health we need to #refreshtheCTGRefresh to #closethegap : At COAG on December 12 : Which states and territories will support a formal partnership with Aboriginal and Torres Strait Islander peoples ? We are calling on COAG to hold off doing this and instead put in place a proper partnership mechanism with us. The new targets haven’t been published and Indigenous peaks are uncertain what the targets will be and therefore we cannot provide our support. As a first step we propose a meeting with COAG representatives and the peak bodies to discuss a way forward that includes a genuine partnership approach. Aboriginal people need to be at the centre of the Closing the Gap Refresh policy; the gap won’t close without our full engagement and involvement. 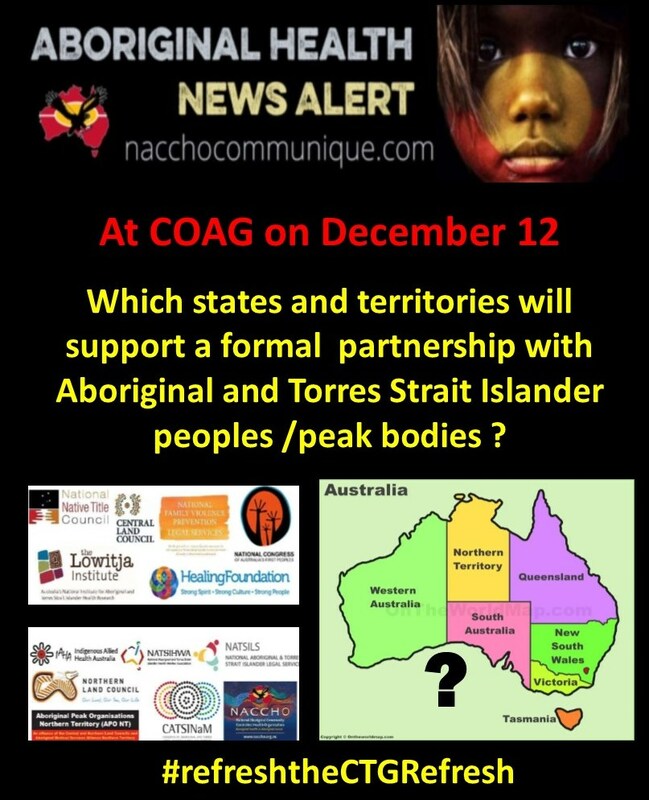 The National Aboriginal Community Controlled Health Organisation (NACCHO) and other Aboriginal peak bodies across Australia have written to COAG First Ministers seeking a full partnership approach between Indigenous people and governments in refreshing the Closing the Gap Strategy, scheduled to be put to COAG for consideration in Adelaide on 12 December. The letter, signed by 13 peak bodies, proposes an urgent meeting of Aboriginal and Torres Strait Islander peak bodies to meet with COAG representatives to determine a framework for reaching agreement on a refreshed Closing the Gap strategy. It’s the second letter the group has written to COAG after failing to receive a response to their initial letter in early October from any government except the Northern Territory. We write again, further to our letter of 4 October 2018, concerning the Closing the Gap Refresh, a joint initiative of the Council of Australian Governments (COAG), to seek a formal partnership mechanism between Aboriginal and Torres Strait Islander peoples and governments in the Closing the Gap Refresh policy. We have only received a response from the Northern Territory Government. As stated in our original letter, all of us believe it is essential that agreement is reached on the Closing the Gap Refresh policy between Indigenous organisations, on behalf of communities across Australia and Australian governments. What we propose is entirely consistent with the commitment made by COAG to set a new relationship with our communities based on a partnership. If governments alone, continue to make decisions about the Closing the Gap, without an opportunity for us to be at the table, it will not be possible to advocate with any confidence or motivate our communities to support Closing the Gap and to take joint responsibility with governments for achieving the targets. The evidence is strong that when Indigenous people are included and have a real say in the design and delivery of services that impact on them, the outcomes are far better. 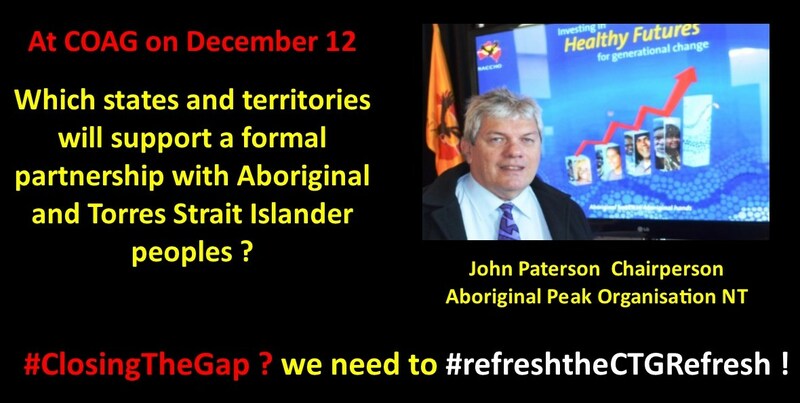 We are certain that Indigenous peoples need to be at the centre of the Closing the Gap Refresh policy: the gap won’t close without our full involvement and COAG First Ministers, who are responsible for the Closing the Gap framework, cannot expect us to take responsibility and work constructively with them to improve outcomes if we are excluded from the decision making. We have proposed a reasonable way forward to Australian Governments in our original letter without making it public to give everyone a reasonable opportunity to consider it. However, we understand that it is the intention of Australian Governments to still settle on targets at the forthcoming meeting of COAG on 12 December 2018. We also understand that implementation arrangements are to be left over for COAG to agree in 2019. We make the points that neither ourselves nor anyone else outside government have seen the proposed targets which we think is way short of being partners and transparent and we cannot see how the targets can be agreed without considering at the same time how they are to be achieved. We assume that Australian Governments will justify agreeing to targets by referring to the consultations earlier this year. Those consultations were demonstrably inadequate. They were conducted at a very superficial level without an opportunity for Indigenous interests to be prepared for the workshops held across Australia. They were based on a discussion paper produced by the Department of the Prime Minister and Cabinet in December 2017 and which stated that only one of the seven targets was on track which two months later was contradicted by the former Prime Minister who said that three targets were on track. Critical elements of the original Closing the Gap framework, particularly COAG’s National Indigenous Reform Agreement, were not referred to at all in the consultations and the focus was on new targets instead of how we could make sure that this time around they were achieved. There was no independent report prepared on the outcomes of the consultations and there is no way of telling if what was said in the consultations is reflected in the proposed Refresh policy including the targets. The consultations started far too late which has left us with 4 targets having expired in June 2018. We do not accept that we have been properly consulted let alone given the opportunity to negotiate a mechanism that allows a proper partnership to be put in place in relation to the design, delivery and monitoring of Closing the Gap. There is a now a significant opportunity to put this disappointing process back on track and in particular to establish a robust Closing the Gap framework founded on a genuine partnership between Indigenous people and governments. It is open to governments on 12 December 2018, to endorse a partnership approach and establish a mechanism to initiate negotiations between representatives of COAG and Peak organisations with a view to developing a genuine partnership as part of the Closing the Gap Refresh. This would be endorsed by the Peak Organisations across Australia. Subject to COAG endorsing a partnership approach, we propose a meeting of Aboriginal and Torres Strait Islander Peak bodies to meet with COAG representatives to determine a framework for reaching agreement on a refreshed closing the gap strategy. We stand ready to do this quickly and would work with COAG on having a partnership framework in place in early 2019 with a revised approach agreed by the middle of the year. Ms Pat Turner AM, the CEO of the National Aboriginal Community Controlled Health Organisation, is our contact for the purpose of responding to this vital matter and we ask that you contact her. 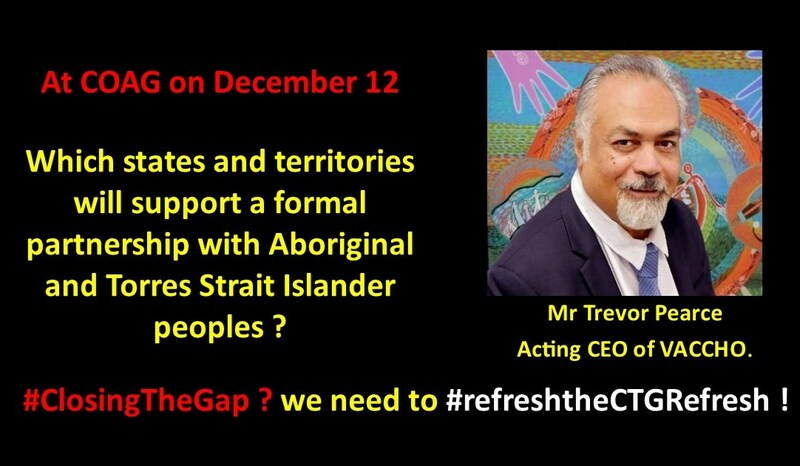 We look forward to working with you on the Closing the Gap Refresh through an established partnership mechanism. 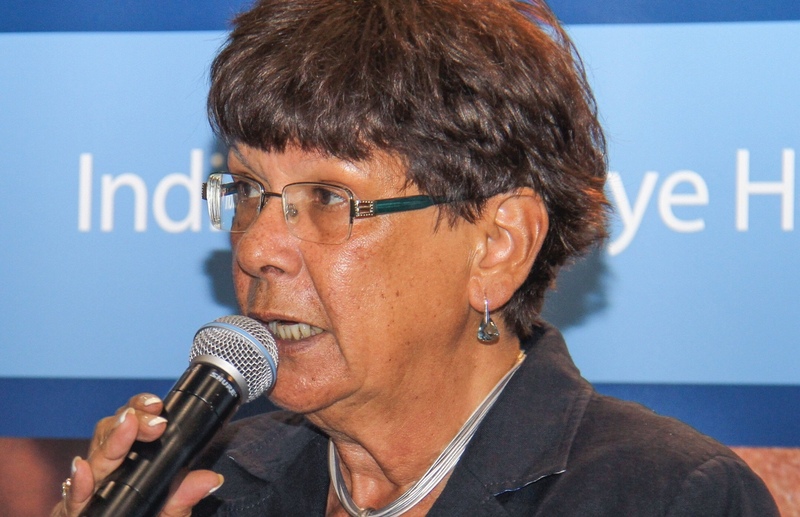 Aboriginal peak organisations have slammed federal, state and territory governments for failing to give Indigenous leaders an effective role in re-energising the faltering Closing the Gap process. 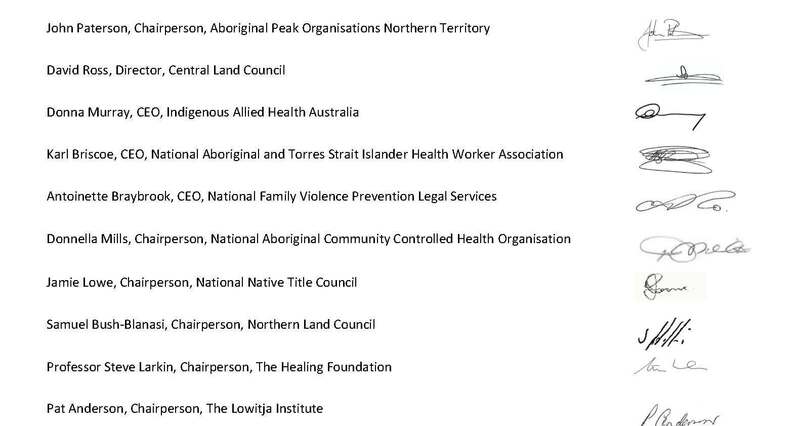 In a letter written jointly to Prime Minister Scott Morrison, chief ministers and premiers, the leaders of the 13 peak bodies say they have been shut out of meaningful consultation about refreshed targets to overcome Aboriginal disadvantage. And they want the Coalition of Australian Governments – due to consider an update to Closing the Gap next month – to defer setting new targets until a fresh pact is hammered out giving “full partnership” to Aboriginal bodies. “I think it’s all gone backwards,” the chief executive of the National Aboriginal Community Controlled Health Organisation (NACCHO), Pat Turner, told the Herald. Ms Turner said only one government – the Northern Territory – had bothered replying to the group when they first wrote a letter a month ago seeking better consultation over new targets and implementation strategies. The peak bodies decided on Sunday to release a second letter they wrote to all governments at the end of last week. The letter says the “disappointing” Closing the Gap process has to be put “back on track” with Indigenous people taking part in the design and delivery of services on the basis of “genuine partnership”. “As a first step we propose a meeting with COAG representatives and the peak bodies to discuss [such an] approach” Ms Turner said. The Herald sought a response from Aboriginal Affairs minister Nigel Scullion but was unable to contact his office on Sunday. Closing the Gap was first conceived of a decade ago as a way to measure Aboriginal disadvantage and set clear targets to redress it. Earlier this year a report from the Department of Prime Minister and Cabinet said three of seven targets were “on track”: to halve the gap in year 12 attainment and halve the gap in child mortality by 2018, and to have 95 per cent of Indigenous four-year-olds enrolled in early childhood education by 2025. However it said that other targets, including halving the gap in reading and numeracy, and halving the gap in employment, as well as closing the gap on life expectancy, were not on track.